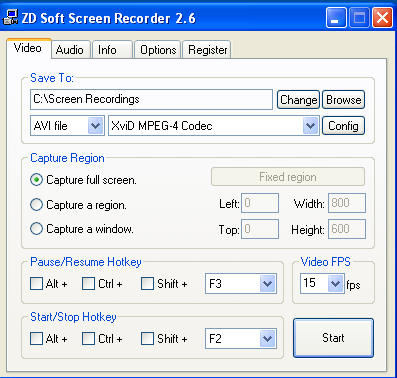 ZD Recorder is a unique software program that can record almost everything displaying on the computer screen, including desktop applications, PC games, various videos (streaming video, flash video, webcam video, DVD video, and etc. 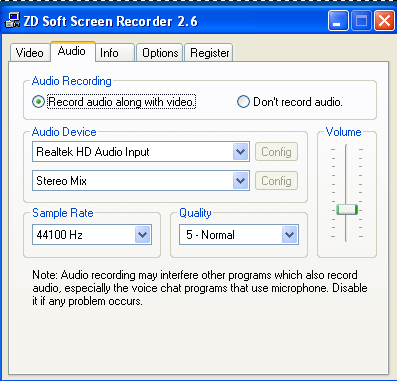 ), and record audio from speaker or microphone simultaneously. * Create demo videos to demonstrate how to do something on a computer. * Make game movies to show how cool you are in the game. * Record interested videos to hard disk for later review. Straightforward user interface, simple settings and smart capture. Most of the other screen recording software on the market can only record those applications use standard rendering technologies, such as GDI and GDI+. If target application uses any special rendering technology, such as Overlay, DirectShow, DirectDraw, Direct3D, OpenGL or etc., they may get nothing because it is hardware accelerated and can not be captured in the common way. Most video players and PC games use special rendering technologies to improve their performance, so few software program can record them correctly. ZD Recorder handles all these rendering technologies and it is the only software program (as far as we know) can record almost all kinds of applications. Minimal performance impact on system. Screen recording is not a simple task. It captures a large number of pixel data from screen to memory and then encodes the pixel data into a compressed video bitstream. Simultaneously, it also captures sound data from sound card to memory and then encodes the sound data into a compressed audio bitstream. This process repeats 20-30 times every second during the course of recording. So there is performance impact on system. If the performance impact is distinct, it would be a bad experience, especially when playing a PC game. 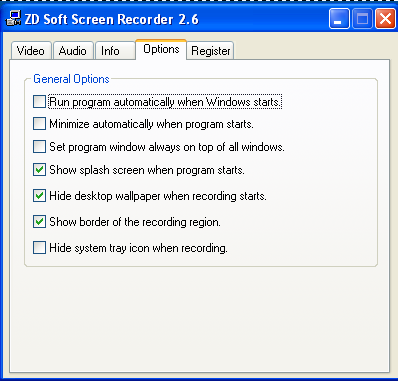 ZD Recorder is fully optimized to reduce the performance impact on system and does perform better than most of the other screen recording software on the market. As mentioned above, real-time audio/video encoding is the key task of screen recording. So, efficient codecs are required. ZD Recorder selects XviD MPEG-4 Codec for video encoding and Lame MP3 Codec for audio encoding. Both of the two codecs are fast, stable and classic. Many real-time video processing software programs may have audio/video sync problem when either audio data or video data is too much for them to handle in real time. 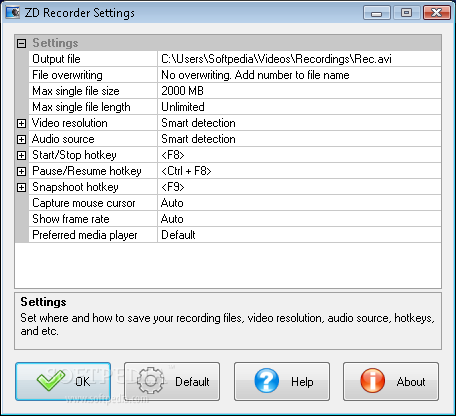 ZD Recorder uses a smart algorithm to dynamically skip overloaded data in order to keep audio and video in sync. Optimized capture engine + Classic codecs = Unbeatable audio/video quality. 1. Easy-to-use: straightforward user interface, simple settings and smart capture. 2. Universal capture capability supports GDI/GDI+/Overlay/DirectShow/DirectDraw/Direct3D/OpenGL technology based applications, video players and PC games. 3. Minimal performance impact on system. 4. Fast real-time audio/video encoding. 7. Saving recordings as AVI files on-the-fly (without creating any intermediate or temporary file). 8. Unlimited recording length (a long recording may be split into several AVI files if necessary). 9. Ultra-thin resizable sticking window that makes it easy to mark the capture area. 10. Smart detection of a video window (very few types of video are undetectable, e.g., flash video). 11. Smart detection of a game window (very few types of game are undetectable, e.g., flash game). 12. Scheduled recording enables to automatically start at a certain time and stop at another time later. 13. Saving snapshots as lossless compressed PNG files. 14. Options to control the overwriting of existing files. 15. Option to limit single file size in megabytes(MB). 16. Option to limit single file length in minutes(Min). 17. Options to control the output video resolution. 18. Options to control the input audio source. 19. Options to redefine the Start/Stop, Pause/Resume and Snapshoot hotkeys. 20. Option to enable/disable capturing mouse cursor. 21. Option to enable/disable showing game frame rate. 22. Option to use preferred media player for video playback. 23. Restoring default settings easily with one-click.